In the poets’ backstage area at Wandering Words at Shambala Festival a few years ago, I saw Jean ‘Binta’ Breeze sipping rum and coke at a wooden table on her own, between the tents and vans, a little apart from the rest of the rowdy poet crew. She seemed content enough but was happy to let me join her. On each of the few occasions I have had the chance to spend time with her, I have felt that Madame-Tussauds-but-actually-real moment when you get to stand next to your hero. She told me a story of her ‘break’ as a poet. It is story which I have subsequently heard her tell on stage, so I suppose it is a public story. As a young woman, she was living in the hills of Jamaica, “living as a Rasta”, smoking too much, eating not enough, struggling to look after her children. Eventually she was sectioned, where, like the woman in the title poem of her debut publication, Riddym Ravings (Race Today, 1988), “di dactar an de lan lord operate / an tek di radio outa mi head”. Nevertheless, when she was released she was still hearing omens and seeing signs in the world around her. One day, the (external) radio was playing Otis Redding, she heard the call and went down to the dock of the bay and wrote. There, with a glow of inspiration emanating around her, a man approached. “You a poet?” he asked, and took her to chant her poems over the music of one of the best known reggae bands in Jamaica. 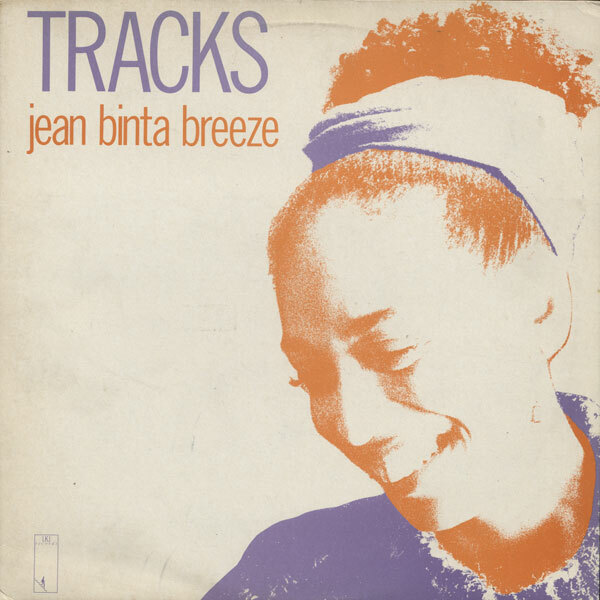 Jean Breeze took the name ‘Binta’ as an African middle name – “one which I could pronounce” – meaning ‘close to the heart’. In her later travels around the world, she discovered its Arabic meaning of ‘daughter of’, the Anglo-Irish misogynist insult ‘bint’, and the South African word for a runaway’s bag. So she is, as she is delighted to explain, daughter of the breeze, a fugitive’s bag and a whore all in one. Born in 1956, she has since 1985 been living between England and Jamaica. She is seven years the junior of James Fenton (supposedly “the most talented poet of his generation”), a year younger than the poet laureate Carol Ann Duffy and eight years older than GCSE English favourite Simon Armitage and yet has written work that to my mind is more important than all of them. Perhaps she has not earned the same modern-canonical status as her peers because she has been pigeonholed as a ‘performance poet’, a ‘dub poet’ or a ‘black (or ‘black-woman’) poet’: a ‘niche’ writer rather than a ‘distinguished’ one. In 2011, Bloodaxe published a long overdue selected works, complete with DVD of two live performances in Leicester and an interview with Jane Dawson. The design, lay-out and editing are less than impressive, the interview is prosaic and the filming amateur, yet it is a comprehensive retrospective of a major modern poet, whose enchanting voice you can hear in recital as you follow the words on the page. In the book’s introduction, Colin McCabe says she “left behind the limited repertoire of dub poetry”, and her poetry certainly does not always conform to the same heavy rhyme scheme or the in-your-face soapbox politics which you might associate with the genre, but it is meant for, and inspired by reggae, and I think that her real achievement was to extend and expand the expectations. Like the slightly better known Linton Kwesi Johnson, she can talk about public events, chant the grievances of the revolutionary class as he does in lines like: “dere woz Toxteth / an dere woz Moss Side / an a lat a adah places / whe di police ad to hide” but also add the personal. The details of her life are the stuff of her poetry – and yet contained within them is the political injustice of poverty, the idealism of revolutionary movements and the beauty of love that separates the lovers from the prosaic stuff of the world around them and those neighbours who “cuss / bout we bedspring noise”. The political is contained within the personal and because it is this way round, the symbolism is more open, the meanings more eternal, the final image transcendent: Venus – the morning star – shines into their bed only because of their material poverty that means there are holes in the “bamboo shack” to let the light in. Yet it is still dub poetry. It is the rhythm that is key. The hypnotic repetitions, so familiar to reggae, are here retained through the repeated line of the title, each time building up a little more detail to explain why “lovin wasn easy”, and the rhythm carrying the poem’s emotive content. 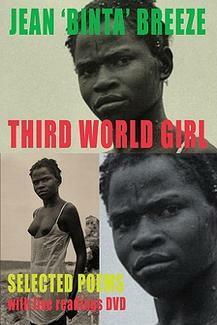 The title piece of her selected poems, Third World Girl is one of the newly published ones and is itself a masterpiece. Reversing the ‘usual’ relationship of subject and object it talks from the perspective of the ‘periphery’ to posh white men like myself, who (I am ashamed to admit) in that late night, worse-for-wear Shambala backstage was telling her the words of her own poems as she gave me a faltering but brilliant private performance, as if I had learned nothing from the poetry which I love so much. and in such a place, with its weight of oppressive history, she is “young unknowing, born too old.” The girl is “uncut diamond / unformed pearl”, something beautiful, someth9ing unformed and something to be extracted, exploited, polished and sold. had to be under alien spell to get it seen”. only happens to the free”. By writing the stories of Third World Girl, Jean ‘Binta’ Breeze has spent nearly thirty years creating poetry that has successfully turned the gaze, making the voice of the person-(particularly the woman) of-colour subject, not object. She has taken a poetry based on a musical style – dub poetry – and both pioneered and innovated within that genre. She has shown us a way to make our personal stories political, to transmute the everyday trivia of our lives into the potent symbolism of art. A couple of days after writing this appreciation, Elizabeth Windsor (and/or whoever chooses these things) awarded Jean ‘Binta’ Breeze an M.B.E in the ‘Queen’s birthday list’. I cannot deny my disappointment, while accepting that I cannot really judge her decision to take it. Born just before independence in Jamaica, perhaps she has always been in some senses a Member of the Most Excellent Order of the British Empire (the lowest ranking of George V’s five classes of chivalry). Perhaps it is the right time to settle her differences, to accept the hard-earned crumbs of recognition. True, it seems unlikely that even with a career as long as Breeze’s, that I might be offered the chance to refuse one; true that if I did so, it would matter less to the establishment that might offer it to me; true that as a British-born man of pale skin and uncomfortably comfortable education, my struggle, such as it has been, to find a place for my voice to be heard has been a very different one. Still, the old-school left-wing republican in me would have liked her to have refused it.